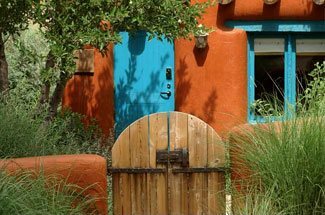 As soon as you step foot in Santa Fe, New Mexico, you will be captivated by the gorgeous architecture, the aromas of freshly cooked chilis, and the incredible history the city holds. During your stay at Four Kachinas, we recommend taking a walking tour of Santa Fe to truly experience it. You’ll learn a lot and be shown some of the most amazing aspects of our area! Do you want to know more about what to do in Santa Fe? Take a look at our complimentary Vacation Guide! We realize that planning a trip can be challenging, so we created our free guide to save you from hours of research. In it, you’ll find activities like a walking tour of Santa Fe, date night ideas, and more. Historic Walks of Santa Fe offers a variety of tours for multiple locations of the city. Their carefully curated tours are meant to ensure that you will see the best of the area. Each guide you will encounter is incredibly knowledgeable; many are art historians, museum workers, and actors that are experts at recreating the past. Whether you are looking to see art galleries or Native American artifacts, these tours can show you! Walking tour of Santa Fe offerings include ghost walks, the general downtown area, gallery focused excursions, and more. If you’re looking for adventure, Santa Fe Mountain Adventures can help. This company offers both leisure and hiking-based options. Whether you are looking to learn about the history of downtown, see a national park, or immerse yourself in the life of Santa Fe artists, they will have a tour for you! Are you a foodie looking for a walking tour in Santa Fe? 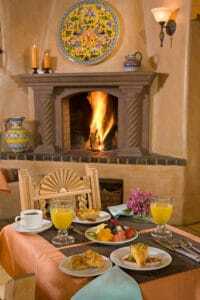 The Santa Fe School of Cooking has made a name for itself as an expert in New Mexican cuisine; you can join them for their popular Restaurant Tours! Each tour has 4 stops at top-rated eateries throughout the city. You will have the opportunity to taste the cuisine and meet the chefs and sommeliers that are among the best in the area. All you need to bring are your walking shoes and a good appetite! If you are looking for a walking tour of Santa Fe, you are probably looking to immerse yourself in our culture. You can do just that during your stay at Four Kachinas. 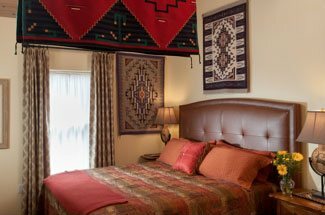 Each of our cozy rooms feature Southwestern decor, giving them a unique character unlike other Santa Fe hotels. Spend the day relaxing in your comfortable room, or enjoy some fresh air in our garden courtyard. Each of our accommodations comes complete with modern amenities including TV’s, Wifi, fireplaces, and more. Plus, you get to wake up each morning and start your day off right when you indulge in our delicious breakfast. Imagine waking up to the smell of freshly brewed coffee as you get ready for the day’s adventures! It’s time to start planning your trip to Santa Fe!